President Trump blasted House Minority Leader Rep. Nancy Pelosi (D-CA) during a rally in Nashville, Tennesee on Tuesday night. While campaigning for Rep. Marsha Blackburn (R-TN), who is running for U.S. Senate, Trump slammed her Democratic opponent, Gov. Phil Bredesen (D), calling Pelosi an “MS-13 lover” after she defended the gang weeks ago. “And of course the MS-13 lover Nancy Pelosi,” Trump said. 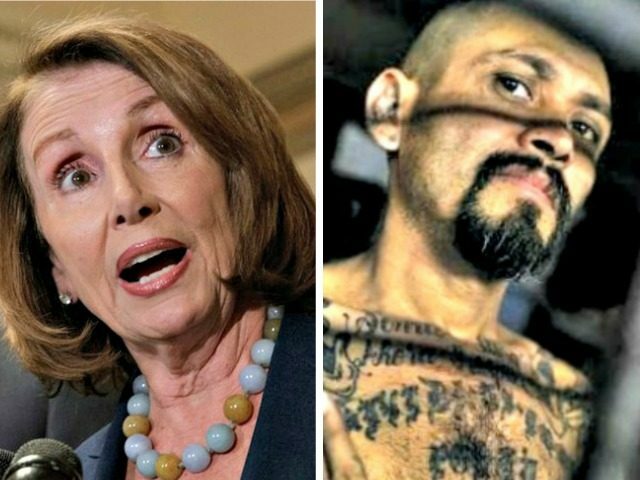 As Breitbart News reported, Pelosi defended MS-13 after Trump called the gang a group of “animals” who needed to be swiftly deported out of the U.S.
“Does he not believe in the spark of divinity, the dignity and worth of every person? ‘These are not people, these are animals.’ The president of the United States,” Pelosi said. White House spokesperson Hogan Gidley recently told Breitbart News that it was “unbelievable” that Democrats have continued defending the MS-13 gang against attacks from Trump. Just this year, a number of violent MS-13 gang members have been convicted of murdering Americans, the most recent a case in which six of the gang members were charged with murder. An explosive report by Breitbart News revealed that nearly 100 MS-13 gang members had been resettled across the country by the federal government as unaccompanied minors. Nearly 65 of those gang members were granted Special Immigrant Juvenile Status (SIJ), which acts as a quasi-amnesty program for young illegal aliens who cross the southern border.